Teachers across the country are not done demanding better pay and better funding. Joining the movement this morning: United Teachers Los Angeles. UTLA will go on strike after negotiations between the union and the nation's second-largest school district failed to reach an agreement. Negotiations began in 2017. Members have worked without a contract for over a year. Over 30,000 teachers are expected to walk out. About 600,000 students will still attend school, taught by "more than 2,000 reassigned administrators and about 400 substitute teachers," reports CNN. The strike comes after months of fruitless contract negotiations between the teacher’s union and the Los Angeles Unified School District. The school system extended a last-minute deal on Friday, but organizers rejected it, saying they’re fighting for the future of the education system — with implications that extend beyond the district’s borders. Nationwide, stagnant teacher wages, crumbling infrastructure and deep budget cuts to education have helped fuel a wave of educator activism. From Arizona to West Virginia, Kentucky to Oklahoma, teachers garnered widespread support and won major victories boosting salaries and benefits last year. And now the movement has a powerful ally joining its ranks. What is at stake is more than pay, but about "the conditions that the kids are learning in," Scout Wodehouse told NPR. Wodehouse is a high-school drama teacher in downtown LA. UTLA deemed the Los Angeles Unified School District's (LAUSD) last offer on Friday "woefully inadequate." The school district counters it cannot afford more. 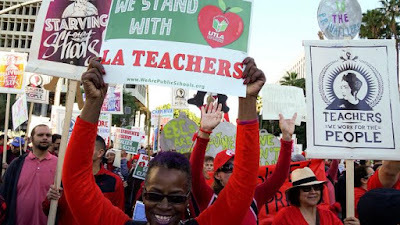 UTLA insists the school district draw on $1.86 billion in reserves to meet teachers' demands. Neither is budging. "This is not an easy decision for us," says Jesenia Chavez, a Spanish teacher at UCLA Community School in the Koreatown neighborhood. She grew up in southeast Los Angeles; some of her students are immigrants, and many are low-income. She says, "Public education for me was a space of transformation, a place for opportunity. And that's why I'm striking." Schools across the district have already informed parents of their plans during the strike, with several noting that kids should bring an extra book to read. The root of these education cuts started decades ago, when state legislators gave tax cuts to the wealthy and corporations during times of economic prosperity. The hope was that it would spur economic growth — but that growth never came. When the economy turned south, states needed to raise more revenue. But conservative lawmakers refused to raise taxes; they just cut spending. And because education often takes up the largest portion of state budgets, schools were hit especially hard. In 2010, Rupert Murdoch, whose News Corp. has been an ALEC member, declared K-12 public education "a $500 billion sector in the U.S. alone that is waiting desperately to be transformed.